Perfectly designed eastern bluebird house. Solid cedar and stainless steel screw construction will last for many years. Easy to monitor, easy to clean, and provide a safe nesting site. This one has it all. Approved by the Northern American Bluebird Society. Made in the USA! Start your own Bluebird trail! Flip up front makes monitoring simple without disturbing the nest. Other features include 1 1/2" Copper Portal with predator guard, excellent ventilation, drainage holes on the bottom, & large overhanging roof. This nestbox is approved by the North American Bluebird Society. 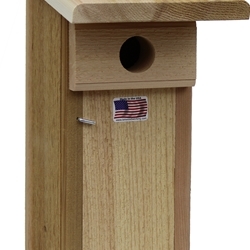 FEEDER FEATURES: Solid cedar & stainless steel screw construction. Aluminum hinges. Directions for use.